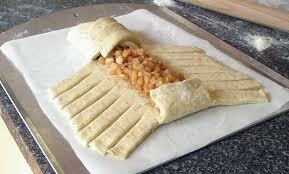 This is a Pampered Chef recipe that I've tweaked a little bit. The actual recipe calls for sliced apples, but I don't care for big chunks. I dice the apples into much smaller pieces and I think they cook better. You can do what you like. Preheat oven to 375 degrees. In a medium bowl, combine cream cheese and powdered sugar until well blended. Add egg, mixing until smooth. Spread half of cream cheese mixture evenly over middle of dough. (I sprinkled with extra cinnamon). Arrange apples over cream cheese mixture. Sprinkle sugar and cinnamon over apples. Spread remaining cream cheese mixture over apples. Sprinkle pecans on top. 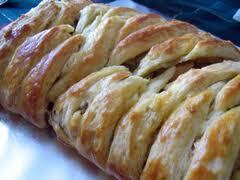 To braid, lift strips of dough across mixture to meet in the center (pinch or twist one turn if needed to hold). Continue alternating strips to form a braid. Tuck ends up to seal at end of braid. Bake 25-28 minutes until deep golden brown. Remove from oven; brush with maple syrup. This was delicious! Our daughter made this Christmas morning :) Thank you for our new tradition! Wonderful! So glad you liked it!